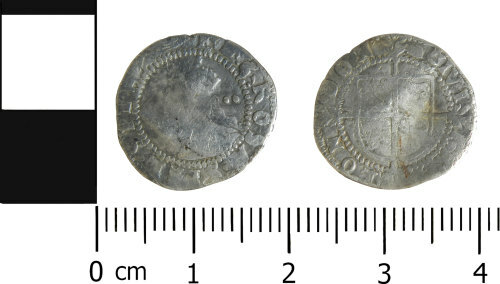 A silver halfgroat of Elizabeth I, (1558-1603). Reverse: CIVITAS LONDON; square shield on cross fourchee. North no. 2016. IM: hand, (1589-1592). Obverse: E D G ROSA SINE SPINA; Crowned bust left with two pellets behind. Obverse description: Crowned bust left, two pellets behind. Reverse description: Square shield on cross fourchee.